I’ve written recently about running kubernetes in containers on an atomic host. There are a few different ways to do it, but the simplest method involves fetching and running the Debian-based container provided by the upstream kubernetes project. Debian is awesome, but I’m team RPM — when I run containerized apps, I tend to base them on CentOS or Fedora. If I can run kubernetes itself from an image based on one of those distros, I can save myself some storage and network transfer up front, and set myself up better to understand what’s going on inside the kubernetes containers. yum ones, changed the default baseimage to centos:centos7, and removed the gcloud-specifc push command. The script expects to get a freshly-built copy of the all-in-one hyperkube binary that wraps together all of the kubernetes components from your local system. I modded the Makefile to grab a pre-built (by the kubernetes project) copy of this binary if it doesn’t exist on your machine. $ make push VERSION=v1.3.6 REGISTRY="YOUR-DOCKER-REGISTRY"
issue with cAdvisor and cgroups. I clicked the version count back to v1.3.6, and that worked. This entry was posted in post on September 20, 2016 by Jason Brooks. In June, the oVirt Project shipped version 4.0 of its open source virtualization management system. With a new release comes an update to this howto for running oVirt together with Gluster storage using a trio of servers to provide for the system’s virtualization and storage needs, in a configuration that allows you to take one of the three hosts down at a time without disrupting your running VMs. One of the biggest new elements in this version of the howto is the introduction of gdeploy, an Ansible based deployment tool that was initially written to install GlusterFS clusters, but that’s grown to take on a bunch of complementary tasks. For this process, it’ll save us a bunch of typing and speed things up significantly. The atomic hosts from CentOS and Fedora earn their “atomic” namesake by providing for atomic, image-based system updates via rpm-ostree, and atomic, image-based application updates via docker containers. This “system” vs “application” division isn’t set in stone, however. There’s room for system components to move across from the somewhat rigid world of ostree commits to the freer-flowing container side. 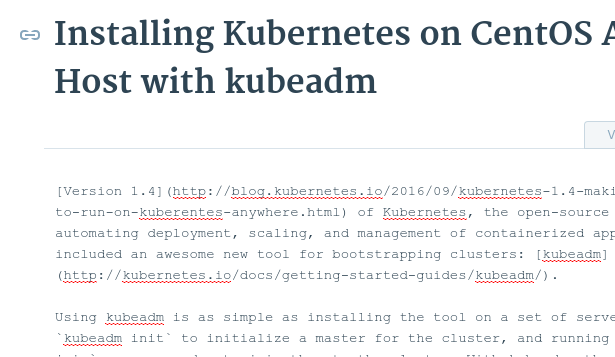 Suraj Deshmukh wrote a post recently about running kubernetes in containers. He wanted to test kubernetes 1.3, for which Fedora packages aren’t yet available, so he turned to the upstream kubernetes-on-docker. Suraj ran into trouble with flannel and etcd, so he ran those from installed rpms. Flannel can be tricky to run as a docker container, because docker’s own configs must be modified to use flannel, so there’s a bit of a chicken-and-egg situation. One solution is system containers for atomic, which can be run independently from the docker daemon. Giuseppe Scrivano has built example containers for flannel and for etcd, and in this post, I’m describing how to use these system containers alongside a containerized kubernetes on an atomic host. You need a very recent version of the atomic command. I used a pair of CentOS Atomic Hosts running the “continuous” stream. With flannel and etcd running in system containers, and with docker configured properly, we can start up kubernetes in containers. I’ve pulled the following docker run commands from the docker-multinode scripts in the kubernetes project’s kube-deploy repository. This entry was posted in post and tagged atomic, centos, docker, fedora, kubernetes on August 15, 2016 by Jason Brooks. This week, the Fedora Project released updated images for its Fedora 24-based Atomic Host. Fedora Atomic Host is a leading edge operating system designed around Kubernetes and Docker containers. While (pretty much) everyone who’s using docker is running it on Linux, and while lots of people run docker on their laptops and desktops, most aren’t running it directly on Linux desktops and laptops. Instead, most individual docker users are relying on some sort of purpose-built Linux distribution running as a virtual machine on their Mac or Windows machine. However, if you are (like me) running Linux on your desktop, you can run docker containers right on your bare metal, with no virtualization overhead in between. Yay, Desktop Linux! But wait. If you are (like me) running Fedora Linux on your desktop, and if you (also like me) weren’t thinking about docker and its particular storage needs when you installed Fedora on your machine, you could be in for some perplexing issues or at least crap performance, because of the way that docker storage works on Fedora. …the AUFS backend that started out as Docker’s default storage option, but never made its way into the mainlain Linux kernel, posed a problem for Red Hat and our upstream first, no out-of-tree bits ways. The settled-upon solution was device mapper thin provisioning, which takes a block storage device to create a pool of space that can be used to create other block devices for Docker containers and images. 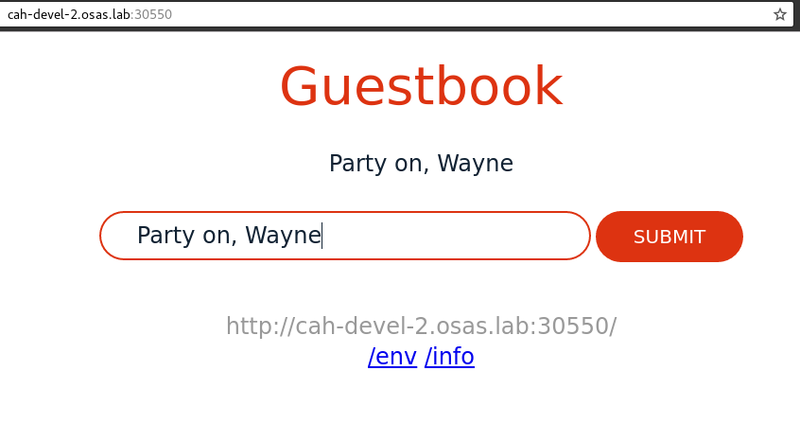 The device mapper backend can be configured to use direct LVM volumes or you can let Docker create a pair of loopback mounted sparse files to serve as the block devices. When you install Fedora on your desktop or laptop, the installer divvies your entire disk up into a small boot partition and a big LVM partition, and then divides that LVM space up into a swap volume that varies in size based on how much RAM you have installed, a root volume of 50GB, and a home volume that takes over whatever’s left. With no room left for the pool of space that the docker device mapper storage driver needs for containers and images, the storage driver will turn instead to crappily-performing loopback mounted files. Boo! NOTE: I guess I should add that whenever you’re mucking with your disks, you should make sure you have backups, and so on, but I have resized my own laptop partitions in just this way on more than one occasion, and I’ve tested the steps written here with a VM as I wrote this, so, yeah. Next, reboot your machine, and when you get back to the login screen, hit CTRL-ALT-F2 to get to a virtual terminal, and then log in as root. We need to do this in order to unmount the home directory before we shrink it. As root, you can use system-storage-manager to shrink down the home volume. Below I’m shrinking the home volume to 20G, because I’m testing these instructions on a VM with a 100GB drive. Substitute a value that makes sense for your rig. If you’ve already installed and run docker, you’ll need to delete /var/lib/docker, where all of your containers and volumes live, so be prepared to rebuild those. When docker starts up again, a script that comes bundled with Fedora’s distribution of docker will check to see that there’s space available in your volume group and will set up your storage correctly. If you want to grow your home volume later, it’s easy to do and doesn’t require unmounting anything. You’ll run the same ssm resize command from above, and swap in your desired volume size. NOTE: If you’re using docker-engine from docker.com, check out these docs for setting up devicemapper driver correctly by hand. 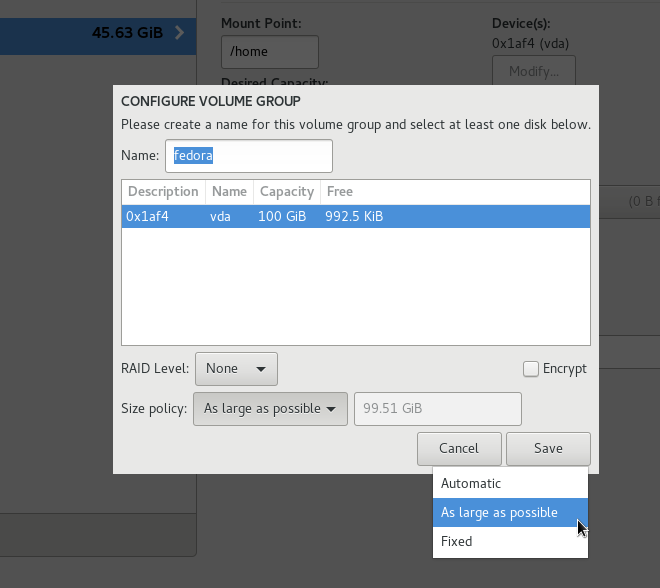 If you haven’t yet installed Fedora, you can configure your system to accommodate this and other LVM storage scenarios moving forward by making your home volume smaller and modifying your “fedora” volume group from its default “Automatic” size policy to the “As large as possible” policy. This way, all your spare disk space will be ready for new volumes (such as the docker thin pool) or for growing your home or root volumes if you decide that you need the space later on. This is probably how Fedora partitioning should be configured by default, anyway, but it isn’t. Finally, there’s another option on the horizon for docker storage on Fedora, an option that doesn’t require partition changes or planning: OverlayFS. I wrote about this in the post I linked above, too, but the TLDR is that OverlayFS and SELinux don’t work together yet, although that’s set to change. Stay tuned. This entry was posted in post and tagged docker, fedora on July 19, 2016 by Jason Brooks.